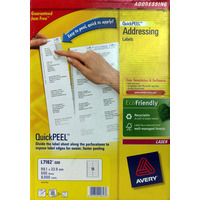 Avery White Mini Laser Labels (Pack of 8400) L7656-100 Pack of 1 Avery Mini Laser Labels White. 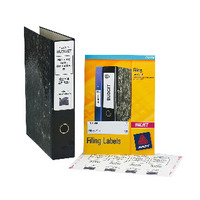 Rectangular labels with permanent adhesive, ideal for organising filing, shelf labelling, product labelling etc. 84 labels per sheet. Label size: 46 x 11.11mm. 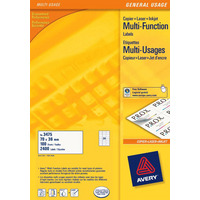 Avery Multipurpose White Labels 65 Per Sheet (Pack of 6500) 3666 Pack of 1 Avery Multi-Function Labels 3666. Multi use labels with permanent adhesive ideal for use on most types of printer, photocopier and multi-function printers. Easy to use with no adhesive bleed and sharp printing results. 65 per sheet. Avery Lever Arch Filing Labels Inkjet (Pack of 100) J8171-25 Pack of 1 White labels are specifically designed for Black and White or colour inkjet printing. Designed to fit lever arch spine they are ideal for organised and professional filing. Easy to format using existing software, 25 sheets per pack. (Laser labels shown). 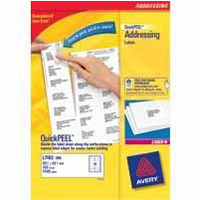 Avery Quickpeel L7160-500 Laser Address Labels (Pack of 10500) L7160-500 Pack of 1 Avery White Laser Labels L7160. Premium labels, easy to use and specifically designed to work in the high temperatures of laser printers, ensuring high quality printing with no toner flaking. Address. 63.5x38.1mm. 21 labels per sheet. 500 sheets per box. 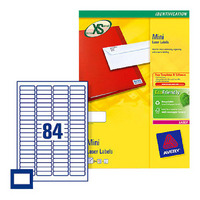 Avery White Laser Adress Labels 99x34mm (Pack of 8000) L7162500 Pack of 1 Avery White Laser Labels L7162. Premium labels, easy to use and specifically designed to work in the high temperatures of laser printers, ensuring high quality printing with no toner flaking. Address. 99.1x34mm. 16 labels per sheet. 500 sheets per box.